So, as most of you are aware of by now, I was elected to be the incoming president of the Science Fiction and Fantasy Writers of America (SFWA), and will ascend to the organization’s board of directors on July 1, along with new officers Vice President Mary Robinette Kowal (who moves over from her current role as the organization’s Secretary), Secretary Bob Howe, South/Central regional director Lee Martindale and Overseas regional director Sean Williams. Continuing on the board are Treasurer Amy Sterling Casil (who was re-elected to the post), Eastern regional director Bud Sparhawk and Western regional director Jim Fiscus. In one sense it’s no surprise I was elected, as I was running unopposed for the position, and therefore was elected with the very large majority of votes. I was made aware that Baron Vladimir Harkonnen also garnered at least one vote, so make of that what you will. In another sense, of course, it’s deeply surprising, especially to me, who up until just a few years ago was not at all involved with the workings of the organization and was happy to be a rank-and-file member. I am not generally instilled with a deep desire to run anything other than my own career, so the path of getting to the point where I’ll soon be handed the keys to the spaceship, as it were, was not a path I would have naturally expected myself to be on. A couple of things happened to get me to that point. The first was that through various events, I became aware that, in fact, the health and well-being of SFWA was important to me, in no small part because I think that at its best, the organization is and can be important and useful to science fiction and fantasy writers. If I really do want SFWA to be at its best, I should be willing to back up that desire with action. In the last couple of years I did my part to back up that belief when past president (now current VP) Michael Capobianco and current president Russell Davis asked me to serve SFWA in various capacities. Through their work, and the work of the current board of directors, SFWA is implementing changes which I think will lead to the long-term health of the organization — and thus, by extension, will benefit its members. Some of the work will need to be completed in the term of the next administration, and I believed that it was important for someone who was philosophically aligned with those goals be in the office of President. As I was, I decided this was one of those “put up or shut up” moments. Be that as it may, I know myself well enough to know that I would not be a good or effective president if I ran in isolation. I am not good at everything; as far as organizations are concerned I have some specific useful skills, but there are other skills the organization requires which I do not have, or which I can perform poorly at best. I wanted and frankly needed other people with complementary and reinforcing skills in order to be effective, and for whom my skills would be a benefit to as well. And so the second thing that happened was that I was extraordinarily fortunate to run with a slate of potential candidates whom I believe formed a complete set of talents and skills necessary to run our organization. First among these is Mary Robinette Kowal, who will be SFWA’s Vice President, and with whom I held a number of long discussions prior to deciding to run. Mary and I are good friends, but this is not necessarily a plus when it comes to working together — indeed, I try to avoid working with genuinely close friends because I often find the work dynamic puts strains on the friendship. But in Mary’s case, I knew she had done invaluable work with the current board and with other creative organizations like SFWA, and had long admired her ability with process, her grace with working with others, and her overall knowledge, skill and intelligence. To say that I was eager to work with her even though she is a close friend is my testament to my belief in her skills. I would not have run for office if she had not run with me. Likewise the other members of our slate who were elected. Secretary Bob Howe comes in with invaluable experience in public relations and a sharp understanding of organizations; Amy Sterling Casil brings her experience as treasurer and a knowledge of SFWA as deep as any on the board. Sean Williams is smart as they come and brings an understanding of the needs of building a writing career. Each of these is a great addition to the board — as is Lee Martindale, who did not run on our slate but whose commitment to SFWA’s membership is amply demonstrated by her previously serving as our organization’s ombudsman, and whose compassion and intelligence is a big plus for the board. All of which is to say that as President, I’m going to get a lot of help from a lot of really smart and capable people (whose number also includes continuing board members Bud Sparhawk and Jim Fiscus). I’m glad I have it and I’m going to make sure I return the favor to them as well, so we all work to make SFWA everything it can be for our members. If you’re wondering about what my plans are as president, the best thing to do is read my candidacy announcement from January. My plans haven’t changed since then. Most of these plans involve internal issues, which are really important to the organization but dead boring for the rest of you. I’m fine with this; I would be extraordinarily happy for SFWA not to have any major public drama during my administration, and to stick to what we know best and what we’re supposed to do: be an organization that benefits science fiction and fantasy writers. Which tangentially brings me to my next point. As most of you know, I’m a pretty public person and also a very opinionated one, and a lot of what I opine on are subjects which relate to science fiction and to publishing and other media in which science fiction happens — all of which is in the bailiwick of SFWA. Or, to put it another way, I’m a big fat loudmouth who is used to saying whatever he likes. Because of that there’s some possibility of me causing a major public drama for SFWA simply by doing what I do around here. I’ll not be discussing active SFWA business here, particularly as it relates to issues currently under discussion by the board. I do imagine I’ll occasionally make SFWA-related announcements here (for example, to remind folks to do Nebula nominations, etc), but that’s not the same thing. I do believe in SFWA being open as possible about its work and its policy. It’s good for SFWA and it’s good for the public. But there are going to be things that a) will benefit no one in discussing too early and/or b) will need to be kept confidential for legal or other genuinely compelling reasons. “Open” does not mean “foolish.” Sometimes there will simply be things involving SFWA I can’t discuss publicly, and won’t. When I do have specific, SFWA-related business to discuss publicly in my role as President of SFWA, I am likely to post it on the SFWA blog rather than here. 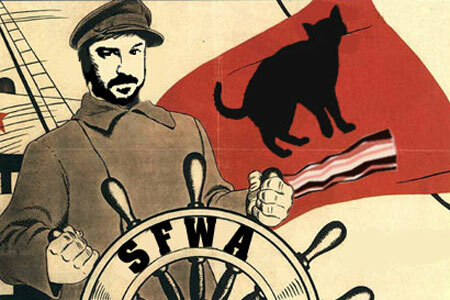 I may link to it from here, but I think it will be useful to make the distinction between me talking as SFWA President, and me talking as me, John Scalzi, freelance troublemaker. Conversely, when I am writing here on a subject related to science fiction, publishing or anything else that touches on SFWA’s mission — and even (or perhaps especially) when it’s on a subject not related to SFWA’s mission — I am writing as a private individual, not as the President of SFWA. My opinions here should not be taken to be the official view of the organization, nor a reflection of that organization’s policies. Furthermore, to avoid confusion, my own personal opinions I have, here or in person, may or may not ultimately align with official SFWA policy on any or all topics relating to writing, publishing, science fiction and so on. This is because “SFWA” and “John Scalzi” are not synonymous entities — one is me, and the other is an organization of science fiction writers from all around the world. The first of these does not run the second by fiat; additionally I will be serving SFWA and its members, not the other way around. Alternately, and to be more blunt about it, it’s one thing for me to blather on a blog; it’s another thing to craft policy for a writer’s organization, with the goal of that policy being to help the largest number of those writers build, maintain and grow their careers. Certainly as SFWA president my opinions will have an influence on policy, but there’s more than one voice on the board, and these voices belong to smart people invested in SFWA succeeding in its mission. These voices will not always agree with mine, because it’s entirely possible that, from the point of view of the benefit of SFWA members, I’ll be wrong. I know! Hard to believe. And yet it happens, from time to time. To be clear I do expect to continue writing here on publishing, writing, science fiction, as well as other subjects which touch on SFWA’s mission, and I suspect I’ll continue to be me when I write about them. But you will understand when I tell you that from now until the end of my tenure how I write about them will be run through the filter of how what I write reflects on SFWA, and I’ll calibrate accordingly. If you can’t understand that, you’ll just have to accept it, because that’s how it’s going to work. Some of you have expressed concern as to how my becoming president of SFWA will have an impact on my output as a writer. It’s entirely possible that it will, since being on the board of SFWA is a lot of work. However, in the short term you, the consumer of fine Scalzi product, will be unlikely to see much change. First, I’ll continue to write here, and expect to continue writing my column for FilmCritic.com. Second, the next novel, Fuzzy Nation, is already written and scheduled for next May. Third, my work on Stargate: Universe will continue through mid-2011 at the very least. Fourth, there are other things in process which should keep you all happy between now and July 1, 2011, when my tenure as president comes to an end. Fifth, hey, I don’t become president for six weeks yet. Could squeeze some stuff in there, you know? Beyond that, for the last several months I’ve been retooling my personal work schedule to make sure I always have some time for creative writing, if only to keep myself from going completely insane. I’m optimistic it will work, although of course I’ll have to be in the thick of things to find out. But at the very least I’ve done what I can to make sure that I’ll continue to be a working writer even as a president of an organization of writers. So, there you have it. Questions? In case you haven’t seen it, the list of this year’s Nebula Award winners, and who’s been newly elected to the SFWA board of directors (including me). In the latter case, we take office July 1.The Nebula winners are, of course, currently winners. I’ll write more later, but I have a column deadline right now, and then I have to go pick up my dog from the kennel. So off with me. Due to some technical issues my Filmcritic.com column came out a little late, but hey, better late than never, correct? So here it is: Some things I would wish for my birthday, as regards science fiction film. It was tied into last Monday being my birthday, you see. These would be for my next birthday. And yes, one of them would involve both Godzilla and Cloverfield. I don’t ask for much! Honestly! Anyway, follow the (belated) link above and as always, feel free to comment there.